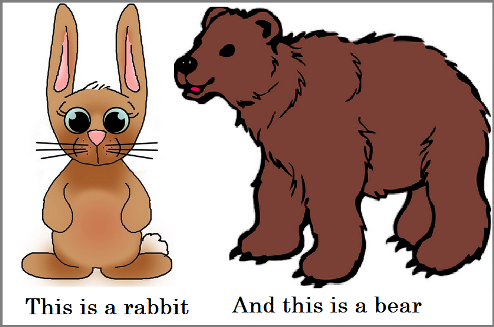 English Admin – Narrative text fable in the story of rabbit and bear. Narrative is the most famous type of text fro student of high school when learning English in classroom. There are some purposes to achieve in a narrative type. Narrative writers prefer showing to telling and that the power of narrative writing. Readers will feel as if they got the experiences by him self about what happens in the text. Actually narrative can be fiction such as short story or novel. Narrative writing is also found in a non-fiction like memoirs. According to Madison smart Bell, the narrative design, or what we call form or structure, is of first and final importance to any work of fiction. In that structure, applying 4 elements of story; characterization, point of view, theme and plot is absolutely important. Plot is the way of the story constructed. Now let’s read the following example of narrative text! The story is written using 4 past tenses. We will show you the list of them after reading it. Here we go! The bear was very gluttonous and did not want the rabbit to get any of the meat. Th e rabbit could not even taste the blood from the butchering as the bear would throw earth on the blood and dry it up. The poor rabbit would have to go home hungry after his hard day’s work. The bear and his family had loaded themselves and packed all they could carry home. The poor rabbit would have to go home hungry after his hard day’s work. He would give the meat with such a great kick. The meat would fly into the rabbit’s house. The poor rabbit would get his meal unknown to the papa bear. The bear would throw earth on the blood and dry it up. He would take it outside with him and pretended to play ball with the meat. The rabbit was a good shot. The bear was always clumsy ad could not use the arrow to good advantage. The bear was very gluttonous and did not want the rabbit to get any of the meat. The bear was the father of five children. The youngest child was very kind to the rabbit. He was very hearty eater. There lived as neighbours, a bear and a rabbit. He could not refuse it. He consented and went with the bear and shot enough buffalo to satisfy the hungry family. That is the example of narrative text fable featuring simple past tenses. Learning English text should be proceeded by having enough knowledge of certain grammatical structure before understanding the text as a whole. Grammar and structure including tenses are helps student understand the meaning of the story. So learning English today still need to have good understanding on grammar and structure.